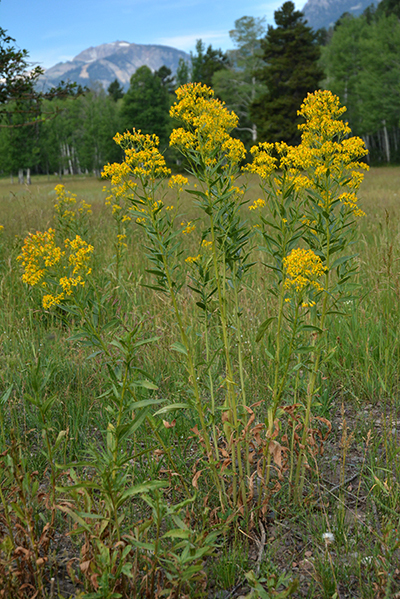 Moose-Wilson Road has an array of tall forbs (wildflowers) – Tall Larkspur, Butterweed Groundsel, and Canada Goldenrod. 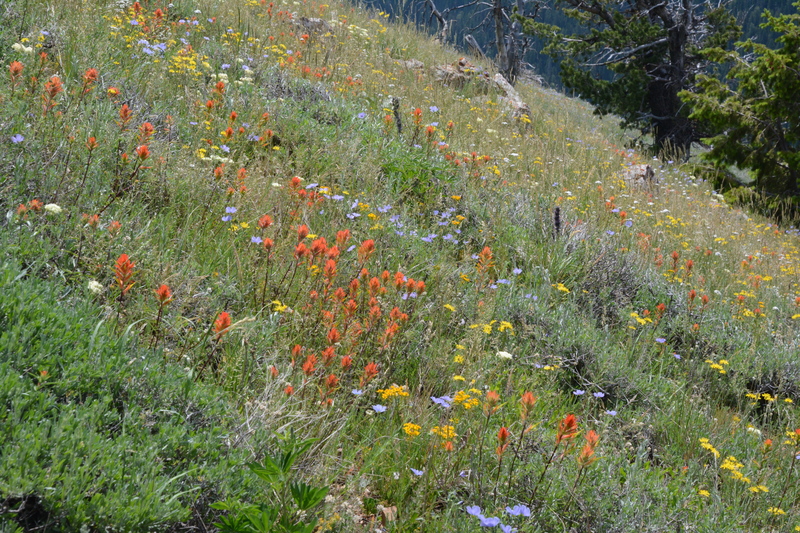 As one drives along the Moose-Wilson Road or up to Two Ocean Lake, or hikes through montane meadows, several tall 3-6’ wildflower species may divert your attention. Most of these thrive in relatively moist and/or cool situations where they can take up sufficient moisture to support their large bodies of stems and leaves, along with plentiful, showy flowers. Moose Pond Trail has a small meadow with Cow Parsnip, Giant Hyssop, Sticky Geranium and more! 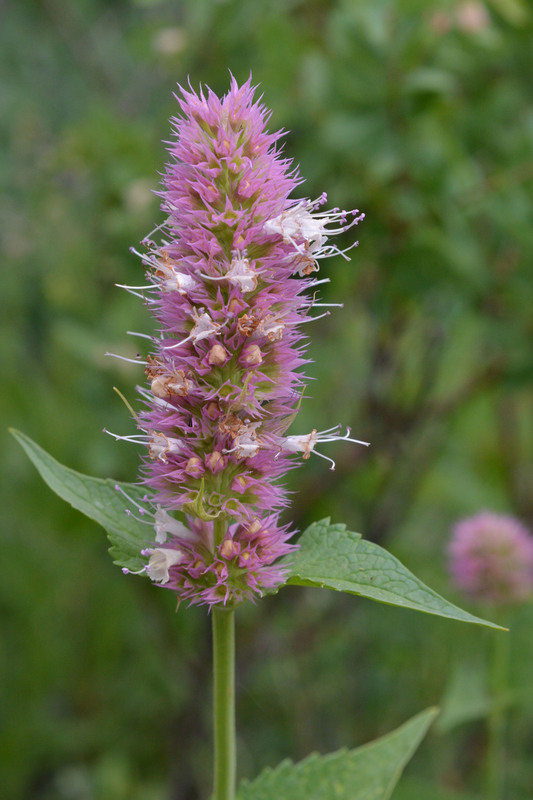 Giant Hyssop – Agastache urticifolia – is a member of the Mint Family. Feel the square stem, smell the fragrant leaves, and observe what comes to the “irregular” flowers. Occasionally it is pollinated by hummingbirds, probably attracted by the reddish pink bracts. The stamens protrude beyond the fused petals, bonking pollen on the heads of pollinators. Pause and take a close look and think about what is happening: What do the flowers look like: are they simple or complicated; all they all the same color or highly variable; what are their pollinators? Unseen variations may be that some species are extremely poisonous. Other species display an extraordinary abundance of flowers this year due to unusual environmental triggers last year. Many factors: environmental and biological–affect what grows where in Teton County and well beyond. Below are a few species to ponder. 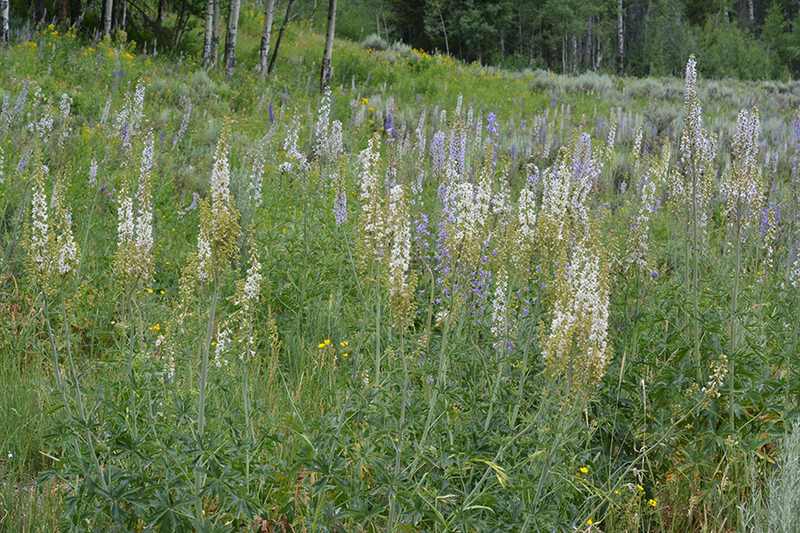 Tall Larkspur – Delphinium occidentale– comes in a range of colors from white to deep blue. 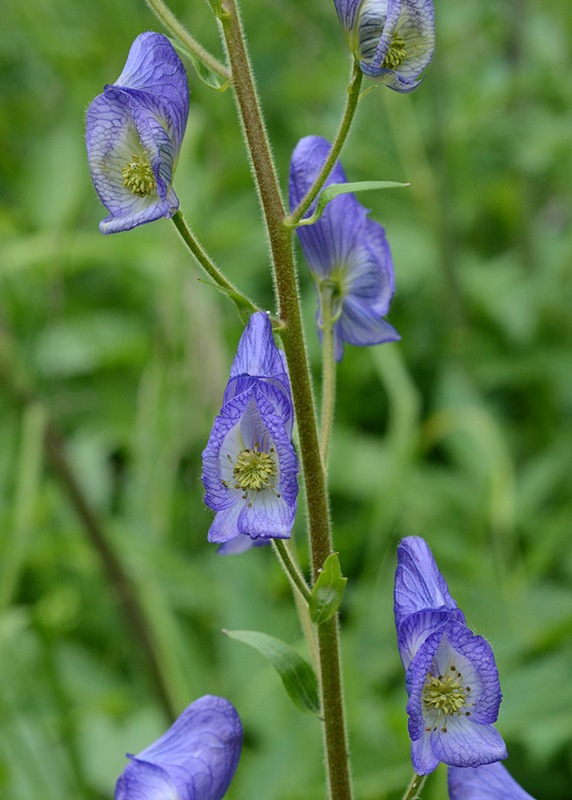 Monkshood – Aconitum columbianum –The genus name Aconitum comes from the Greek akoniton: Theophrastis used this name to indicate “poisonous plant”, which indeed it is! 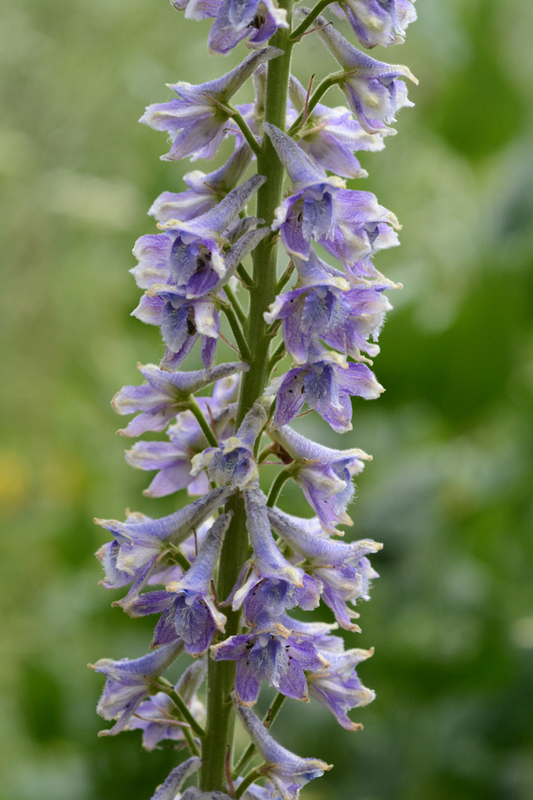 Monkshood – Aconitum columbianum – is related to the similar looking Tall Larkspur (see above). both are in the highly variable Buttercup Family and have complicated flowers. It is also deadly poisonous. Monkshood is pollinated by both queen and worker bumblebees, as well as moths and hummingbirds. Observe the structure of the flower. The five sepals (not petals) form a complex purple flower. 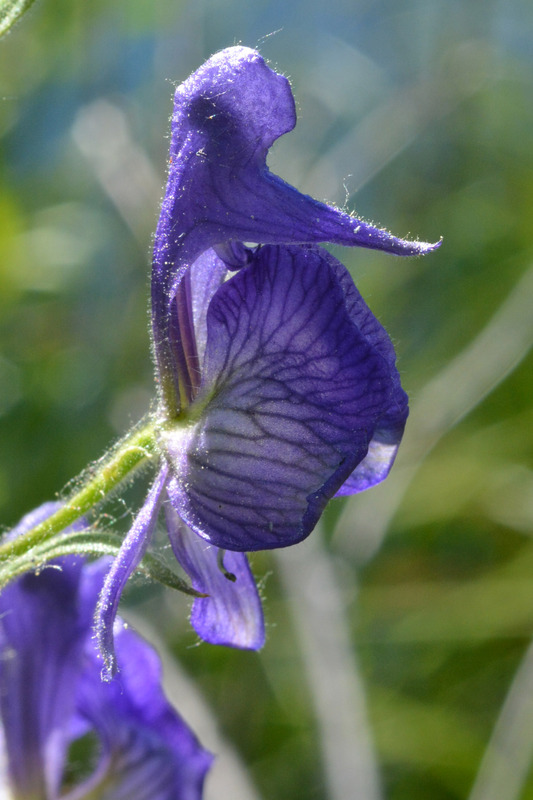 Monkshood sports a “hood” that covers two petals and nectaries. Four additional sepals: two side, two bottom, surround the many anthers and three stigmas. All parts of the plant are poisonous. Found in wet meadows. The two lower and two side sepals encase and then expose the numerous anthers, while the hood covers two greatly altered petals which contain a stiff coiled spur terminating with nectar glands. Observe when the anthers open and release their pollen (then fade), and when the 3 hidden stigmas become available amidst the anthers: the timing of the male and female reproductive parts is separate to facilitate out-crossing. Sharp-tooth Angelica – Angelica arguta – A member of the Parsley Family – as one can tell by the umbrella arrangement of their tiny flowers, this plant typically grows to 4-5’ in moist montane situations. 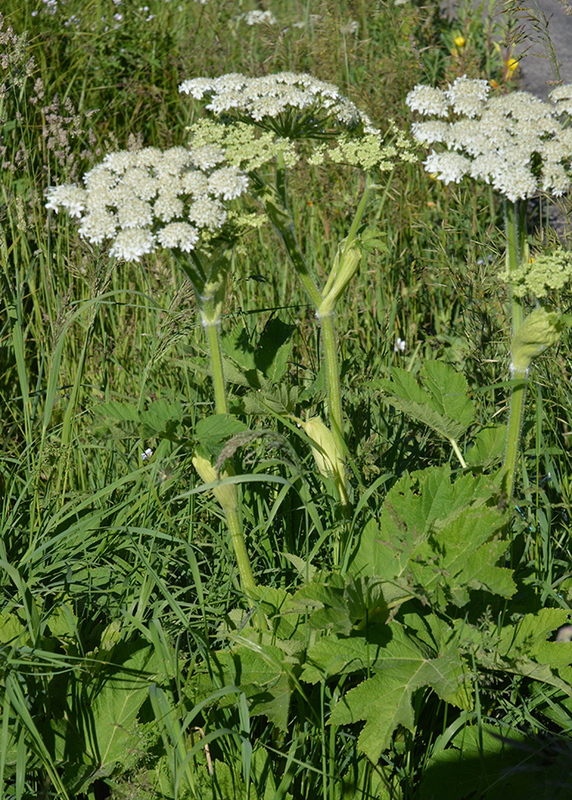 Sharp-tooth Angelica – Angelica arguta – is in the Parsley Family, same as Cow Parsnip (see below). But Angelica has more divided leaves and has a smooth, not hairy, stem. Sharp-tooth Angelica can be mistaken for the more robust Cow Parsnip, but notice the large, toothed leaves are divided into numerous, smaller leaflets. The stem is smooth and slightly bluish. Angelicas have been used for medicines by many indigenous people, but note the species also resembles Water Hemlock – Cicuta maculata – called “suicide plant” by the Iroquois – which also grows in moist to wet sites! Always make sure you know the ID of any plant you use! 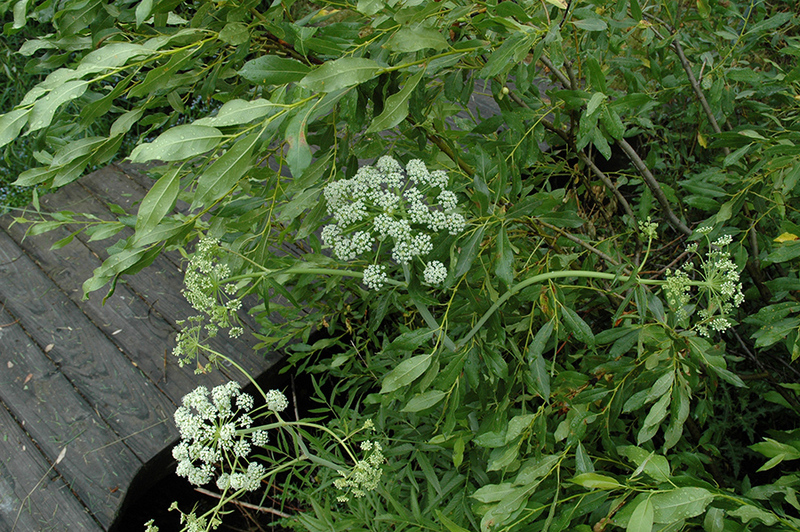 Water Hemlock – Cicuta maculata – grows in similar wet places and can be mistaken for Angelica. The Iroquois called this plant “suicide plant” for a reason. Here it is in a ditch in Wilson. Water Hemlock – Cicuta maculata – looks very similar to Angelica, but it is not an angel! It is deadly poison. Note the side veins end at the indentations of the teeth of the leaf. Know your plants well before you touch or eat them! Cow Parsnip – Heracleum spondylium – One of the largest and most obvious members of the Parsley Family, this giant is found in wet meadows. The inflorescence is the size of a dinner plate. 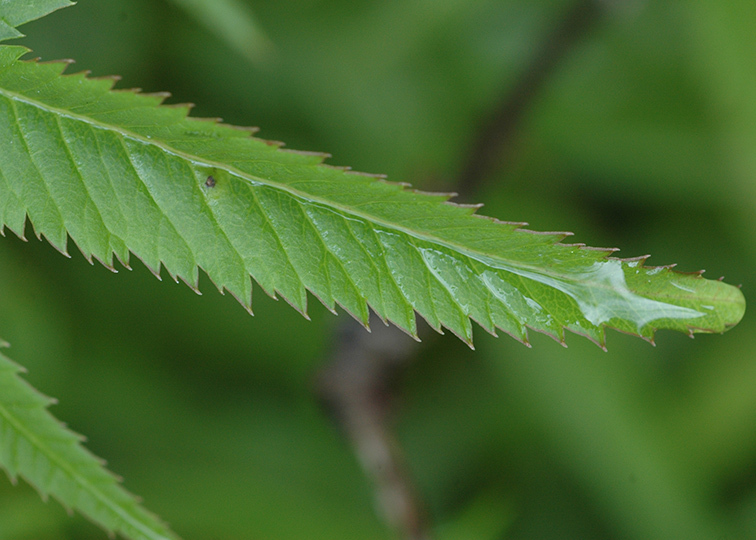 The stems are very hairy (hairs may cause a rash) and the giant leaves are divided into three large, jagged lobed leaflets. Many pollinators take advantage of the numerous tiny flowers. Cow Parsnip – Heracleum spondylium – has large jagged leaves, plate-sized flower clusters, and very hairy stems. The hairs can cause a rash in some people. Butterweed Groundsel – Senecio serra – This tall, 4-5’ yellow composite plant is frequent in moist to wet meadows. The leaves are 4-5”, oblong to lance-shaped, with many teeth (unlike the similar S. triangularis whose leaves are elongate triangles.) Senecios typically have a “palisade fence” of waxy, even-sized bracts surrounding the flower head. In this case, each bract is black tipped. The showy ray flowers are few—here about 6-8, and the disc flowers several. Combined, the head provides a platform for many pollinators—including butterflies–which can crawl over and sip nectar from each of the tiny goblet- shaped disc flowers. The fruits (achenes) will have a tuft of white fluff to help send them on their way. “Senes” = old man. Ragwort is another common name. 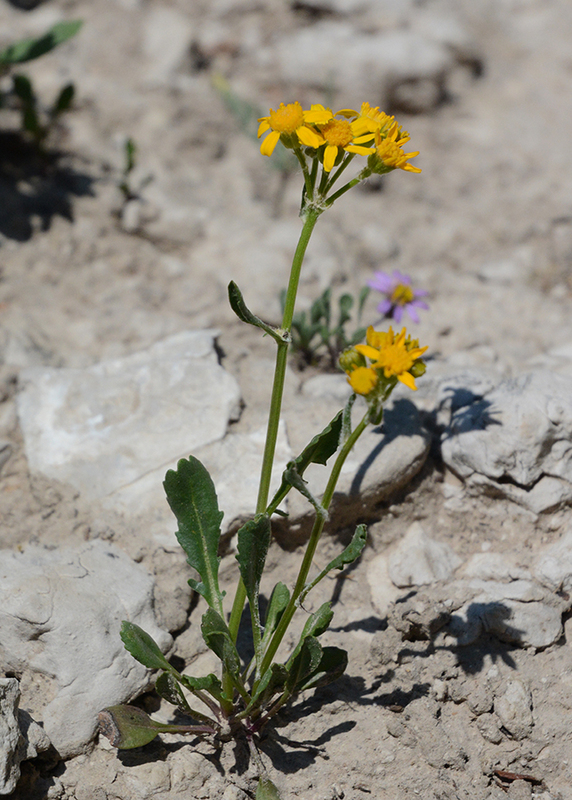 Butterweed Groundsel – Senecio serra – is common along road sides and in meadows right now. 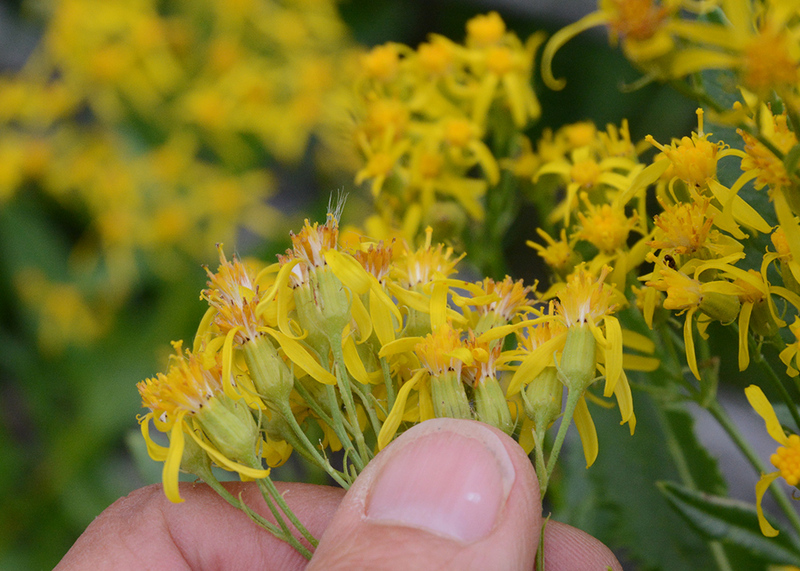 The 5-6″ elongated, serrated (like a saw) leaves help separate it from other large Groundsel species. Butterweed Groundsel has shiny, even sized bracts, often black-tipped, surrounding each head of flowers. Five-veined Little Sunflower/Helianthella –Helianthella quinquenervis – Not so little, this 3-4’ robust plant is closely related to One-flowered Sunflower (H. uniflora) seen throughout the valley these past few weeks. 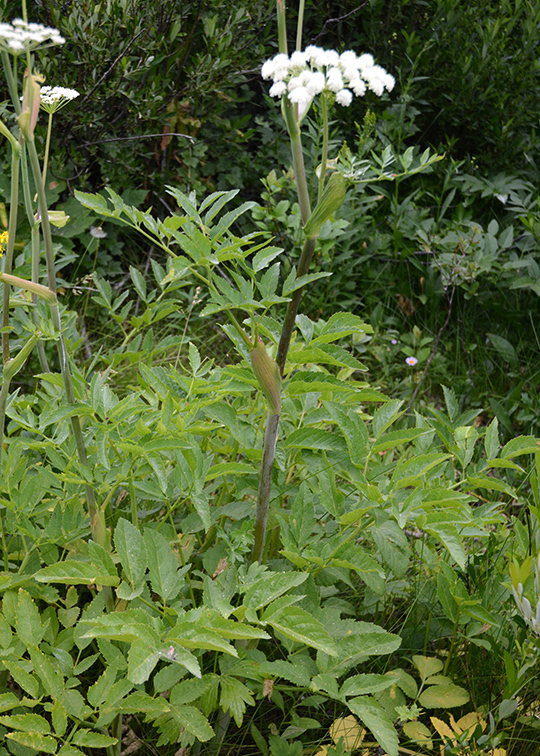 This species is larger, the flower heads are bent at right angles to the stalk—they appear to glare straight at you, and the lower leaves have 5 strong veins. It prefers more moist conditions than H. uniflora. Five-nerved Helianthella – Helianthella quinquenervis – appears to stare right at you! Five-nerved Helianthella is named for its 5 strong veins on the lower leaves. Western Coneflower – Rudbeckia occidentalis – This member of the Sunflower Family never looks quite in bloom (compare to Helilanthella above). We expect yellow “ray flowers” to whorl around the outside of each “head”. However, in this species, there are no flashy ray flowers, only a whorl of green bracts. There is a “cone” of tiny “disc” flowers which begin to bloom from the base and gradually, with time, spiral up to the tip. The bees know it is ready for pollination somehow and are often seen crawling around, dipping their mouth parts into the tiny maroon cups for nectar and collecting pollen. 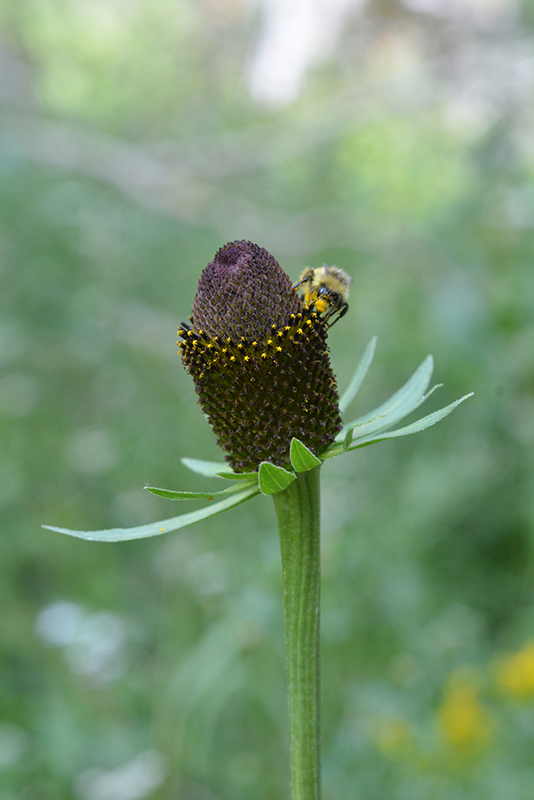 Western Coneflower – Rudbeckia occidentalis – Tiny disc flowers with yellow pollen attract bee pollinators. It flowers from bottom to top. Mountain or Wild Hollyhock – Iliamna rivularis – Many people notice this pink plant popping up here or there along the park road or main highway, as well as in meadows or woodland edges. Mountain or Wild Hollyhock – Iliamna rivularis – pops up along highways, in the woods, and especially in areas after forest fires. The stems are lined with many large 2-3” flowers. The stamens form a tube in the center with 5 roundish stigmas sticking out. The leaves are like maple leaves. The fruit of Mountain Hollyhock – Iliamna rivularis – looks like a hairy tangerine. The hairy fruit will look like a somewhat compressed 1” tangerine which divides into several sections. 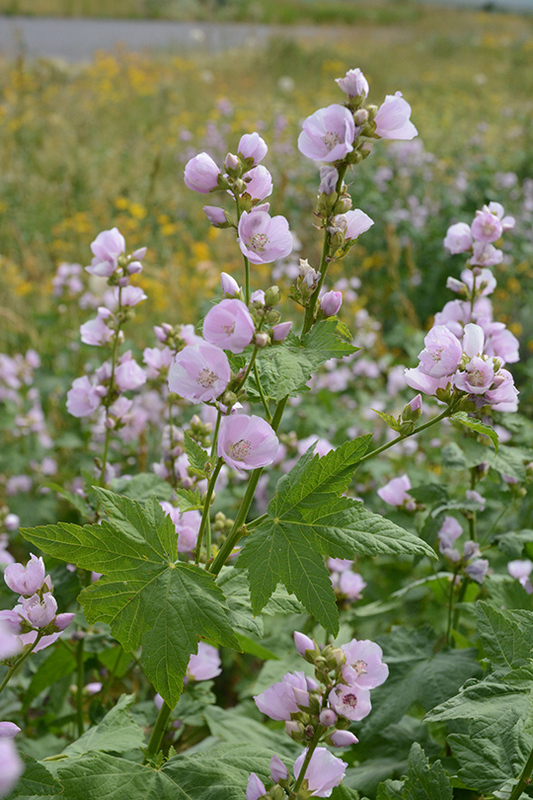 This plant in the Mallow Family (Malvaceae) is related to garden hollyhock, marshmallow, okra, and cotton. 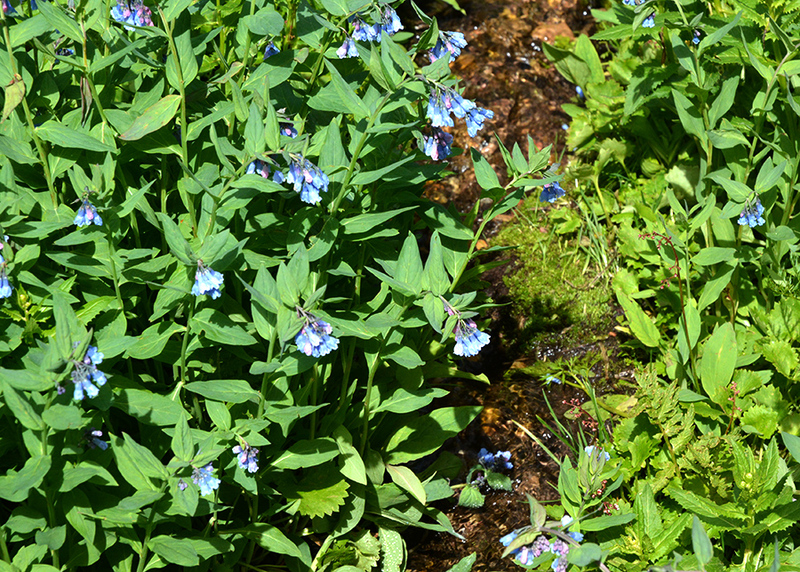 Mountain Bluebells – Mertensia ciliata – Colonies of 2-3’ bluebells inhabit wet seeps and meadows at high elevations. Mountain Bluebell – Mertensia ciliata – colonizes wet meadows at high elevations, for instance above Ski Lake. The 2-4” oval, bluish green leaves alternate up the stems which often arch over stream sides. The dangling tubular flowers start out pinkish and then turn blue when ready to attract bumblebee pollinators. The anthers have small pores at their tips. The frequency of buzzing bee-wing muscles shakes out the pollen onto the bee! 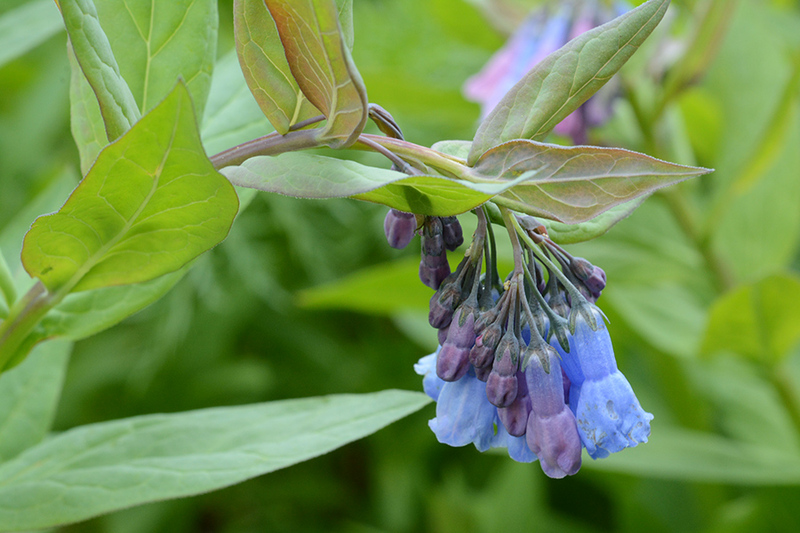 Mountain Bluebells – Mertensia ciliata – are buzz-pollinated. Bees vibrate their wings at a certain frequency, and pollen falls onto their bellies! Note the flowers go from pinkish purple to light blue, signaling to the bees when to visit. Mountain Bluebells are self-compatible—they can receive their own pollen and make seeds, although the resultant off-spring often are not as strong – inbreeding depression. 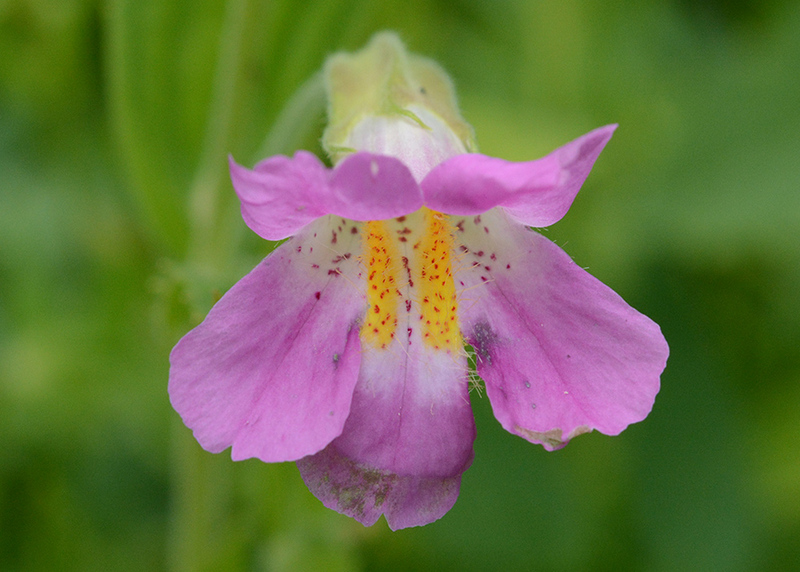 Monkey Flower – Mimulus lewisii – These cheerful brilliant pink flowers with splashes of yellow on their lower petals ornament rivulets and seeps in the cool mountains. The leaves of Monkey Flower, which have three strong veins, are arranged opposite to each other along 2-3’ stems. They are pollinated by bumble- and mason bees. Lewis’ Monkey Flower – Mimulus lewisii – graces seeps with its cheerful blooms. You can see the nectar guides attracting bumble- and mason bees into the center of the flower. Some of you may have seen a very similar species in the Sierras – M. cardinalis – whose red flowers are pollinated by hummingbirds. In the laboratory, the species will interbreed; however, in nature where the ranges of the two species overlap they do not exchange genes: the pollinators are different. Therefore, the two species maintain their integrity and continue to evolve in their own way. 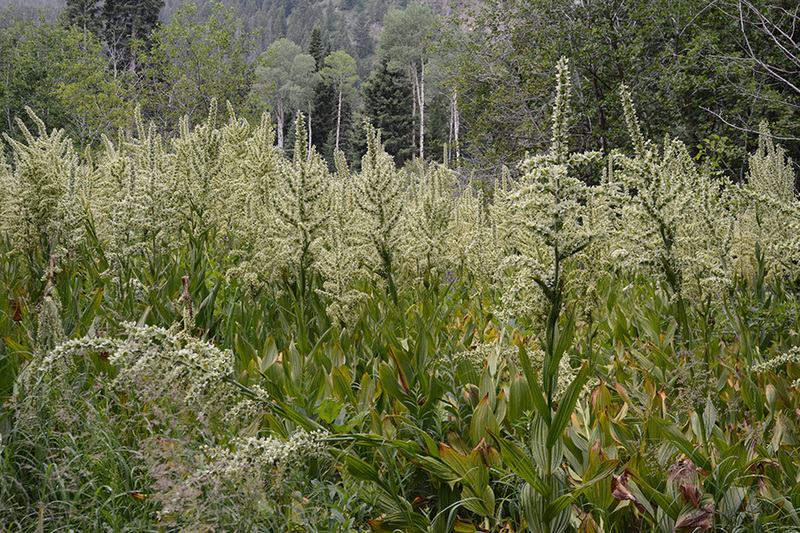 False Hellebore – Veratrum californicum/tenuipetalum – is having a “mast” year. This profuse stand is growing the west end of Phelps Lake. 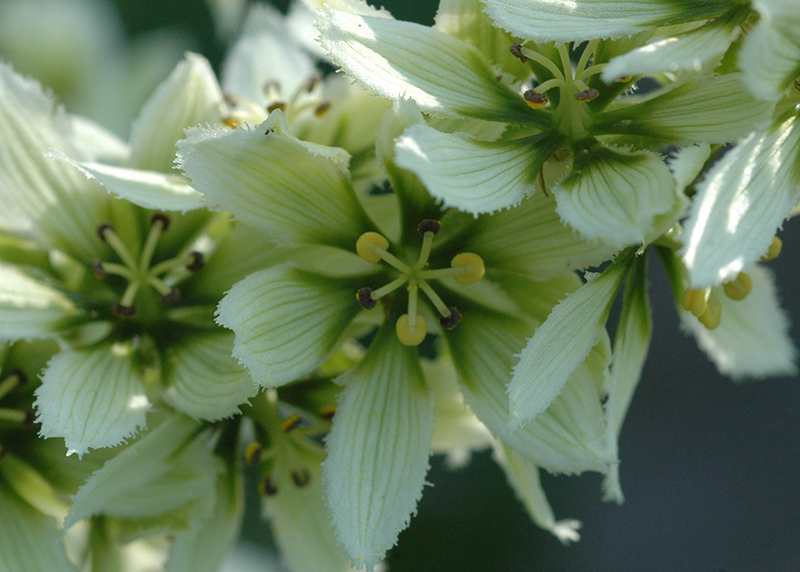 False Hellebore – Veratrum californicum/tenuipetalum – This is a very poisonous plant in the Lily family (now split off into the Bunch-berry Family-Melanthiaceae) which grows in very damp soils. It has formed a very large, 6’-7′-tall colony along the west end of Phelps Lake this year. This is a display of “masting”—when a plant species produces many, many flowers and fruits synchronously in one year. The overabundance attracts many pollinators: flies during the day, moths at night, and the plentitude makes it difficult for all the seeds to be consumed. The abundance of flowers of False Hellebore first satiates pollinators, and then once they are pollinated, hopefully flowers produce an abundance of seeds–too many to be eaten by hungry predators. Research indicates that “masting” of False Hellebore is cued by cool July temperatures the previous year, a trigger which could be affected by warming of climate change. Observe the flowers near the top of the bountiful flower stalks: they are typically male and female, while the lower flowers are only male. See if you can find the difference. Look at the flowers of False Hellebore closely. Apparently the upper flowers are “perfect” with both male and female parts. The lower flowers have only male parts. Hard to tell which this example is. These are just a few of the fascinating flowers in bloom right now. A future posting will discuss some of the smaller species that are beginning to flourish. In any case, keep on hiking, observing, and enjoying the bounty of flowers we have this summer! P.S. As always, this blogger appreciates comments, corrections, additions to the information provided here. This past week flowers have become spectacular in the mountains. 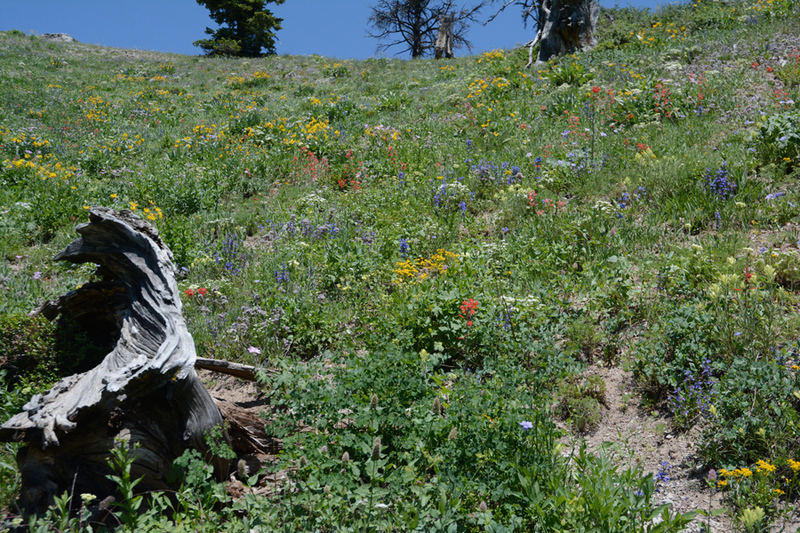 For instance, the trail south from Teton Pass to Mt Elly (upper part of Black Canyon Trail) in the Bridger-Teton National Forest display an array of flowers thriving between elevation 8,431’ up to 9,275’. 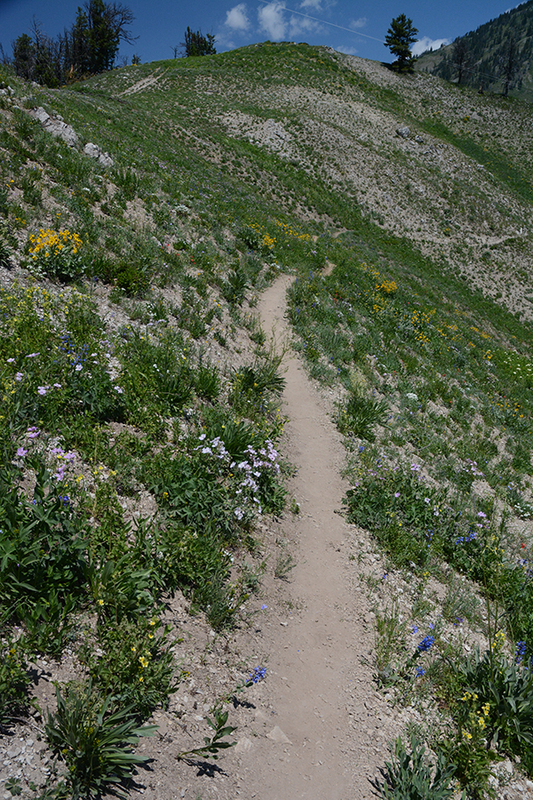 Other high elevation routes, such as Ski Lake Trail, have similar species. With the heavy snow pack, colder temperatures, and late snowmelt, flowers bloom much later in the mountains than in the valley floor at approx. 6400’. And they bloom all at once! 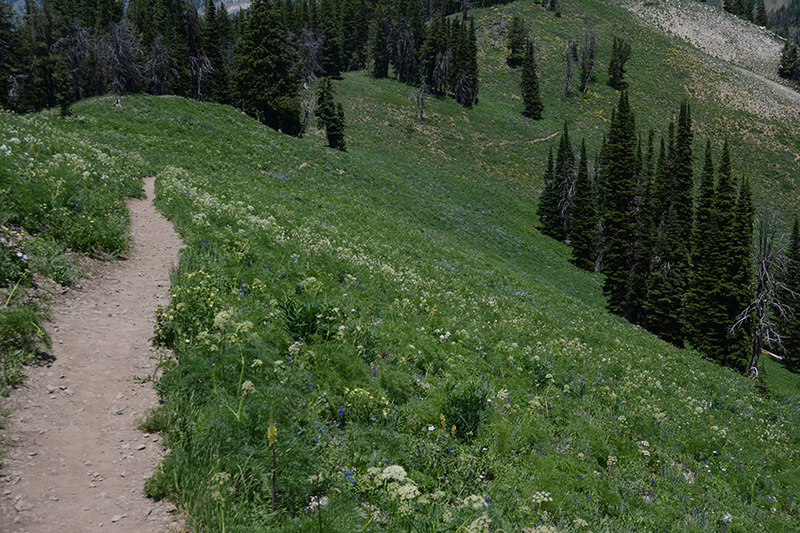 Trail south of Teton Pass is in full bloom in early July. 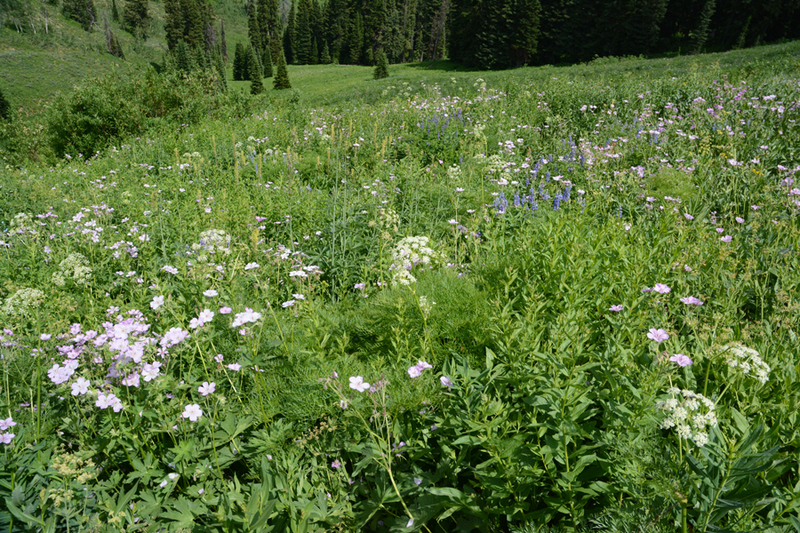 Sticky Geranium, Fern-leaf Lovage, Silver Lupine, and Bracted Lousewort are just a few flowers covering the slopes. Last week one could see plants of early spring – spring beauties, low larkspur, multiflora phlox–with plants that have just finished blooming on the sage flats and aspen groves – balsamroot, hawksbeard, louseworts–with summer bloomers: columbine, Wyoming paintbrush, sweetvetch. Furthermore, the more alkaline, sedimentary soils of mountains south of the granite Tetons provide for some specialties. A walk 1.5 miles south of Teton Pass takes you through montane meadows, spruce-fir forest, subalpine talus and three months of bloom! 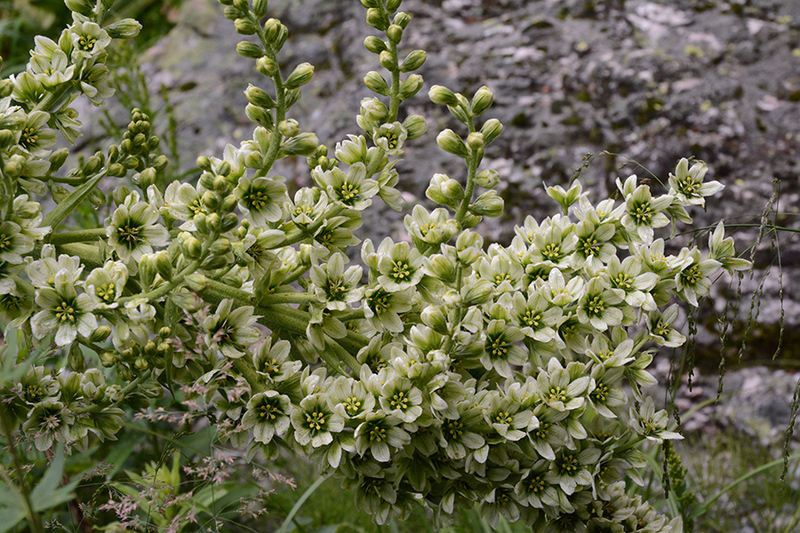 The trail south from Teton Pass travels through some limey talus–hot and dry–with interesting plants! 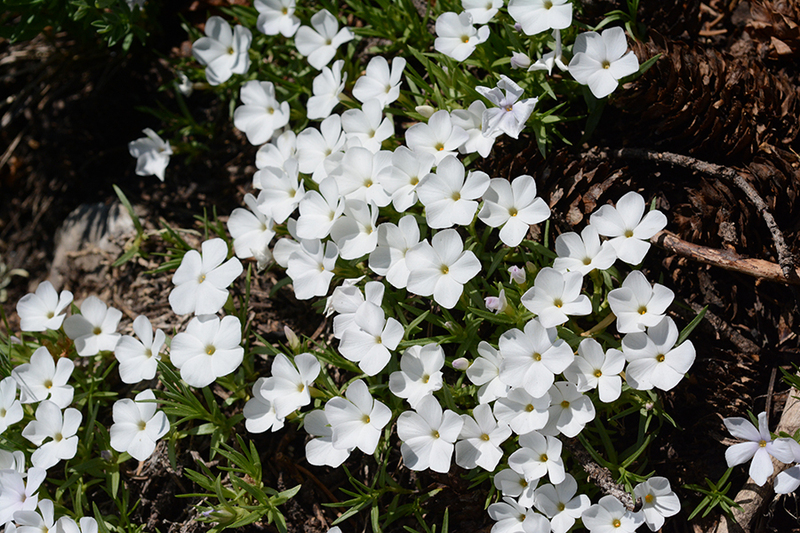 Multiflora Phlox – Phlox multiflora – was still blooming on Teton Pass last week! It was blooming the the valley in early May. Its fragrance is remarkable. 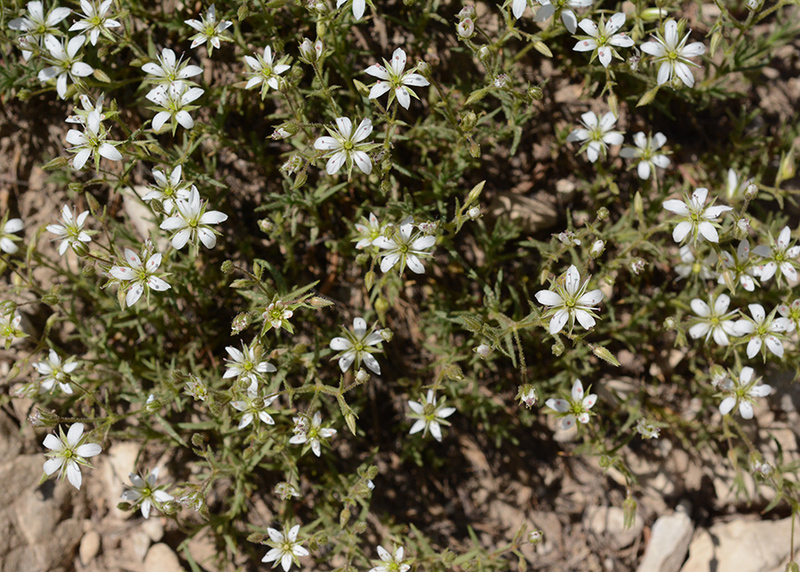 Nuttall’s Gilia – Leptosiphon nuttalii – is related to phlox and also to Scarlet Gilia (see below). They are in the same family with tubular 5-parted flowers. It forms mounds on dry edges of forests or rocky areas, both south of the pass and on the way to Ski Lake. The flowers of Nuttall’s Gilia remind one at first of Phlox, but the leaves appear needle-like and whorled. (Actually they are deeply dissected opposite leaves.) 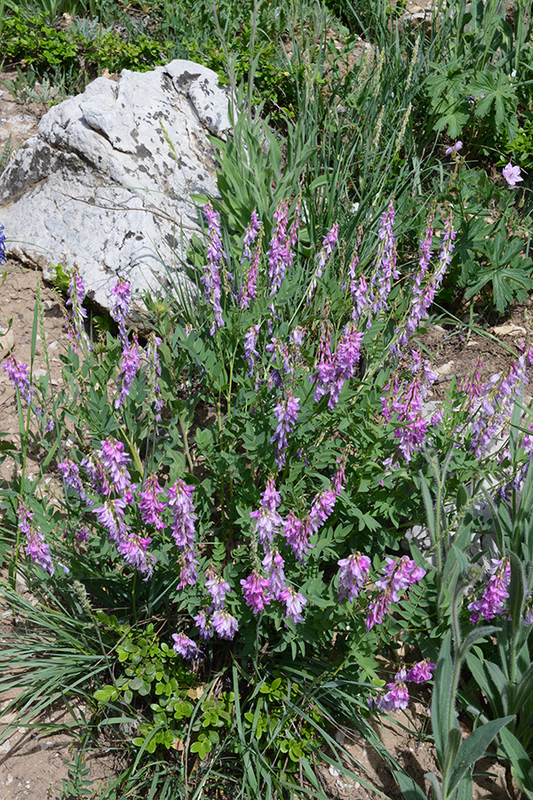 Nuttall’s Gilia – Letosiphon nuttalii – is frequent on the Teton Pass Trail and on the way to Ski Lake. One of the smallest (maybe 2-3″ high) and oddest plants is Opine Stonecrop – Sedum debile. 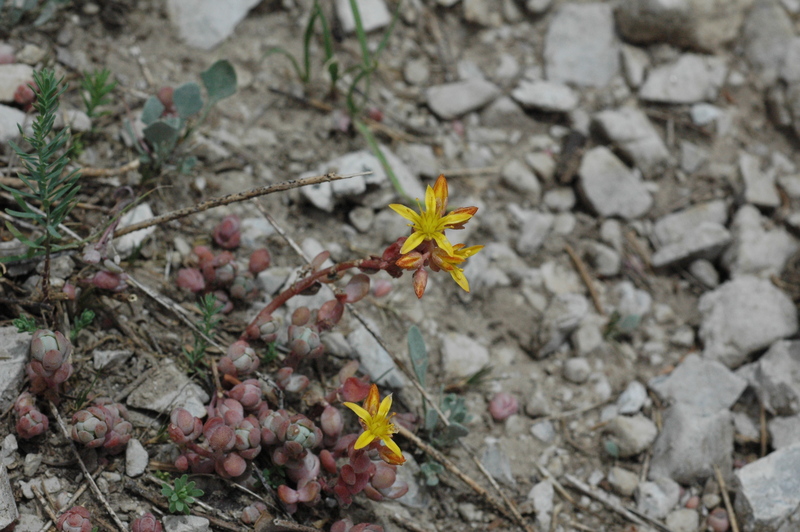 Unlike its cousin Lanceleaved Stonecrop – Sedum lanceolatum, the succulent leaves are rounded and opposite and have a rosy color. The 5-parted yellow flowers are similar. The fleshy leaves of succulents are designed to hold water through droughts. Often, they can start new plants from the leaves — some of us may remember propagating Jade Plants (a popular houseplant) the same way. Another specialty of the limestone talus, delicate Nuttall Sandwort – Minuartia nuttallii – forms very low mounds on dry sites. 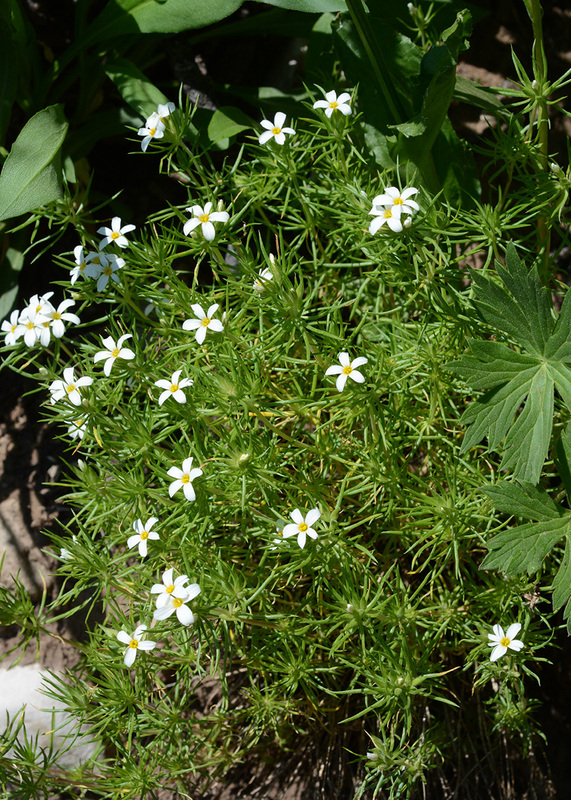 It may look a bit similar to the Nuttall’s Gilia, but the single neeedle-like leaves are opposite and the 5 white petals are separate, not fused into a tube. Nor are they as fragrant. Scarlet Gilia – Ipomopsis aggregata – is another adaptable plant in dry sites. 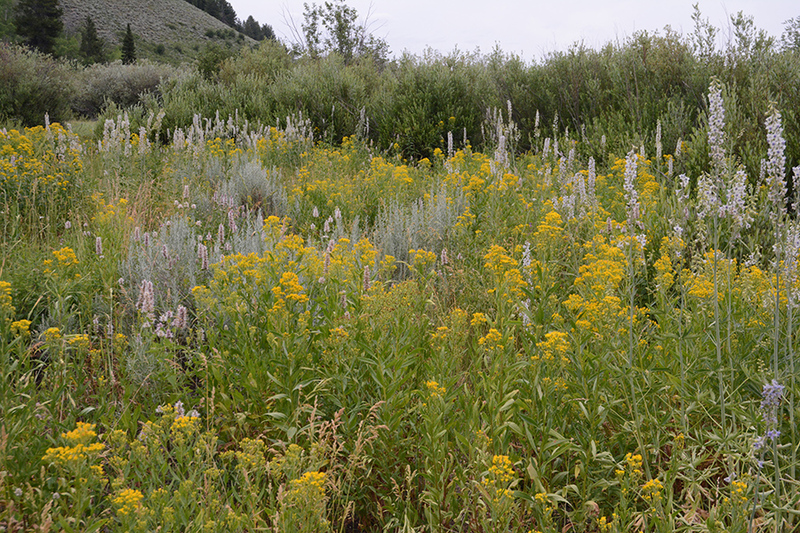 It is still blooming in sage flats in the valley, as well as now in high mountain meadows. It raises its sturdy, elegant, 2-3′ stems above many surrounding plants. Note the finely dissected leaves. The red, trumpet-shaped flowers are perfectly designed to attract hummingbirds for pollination. 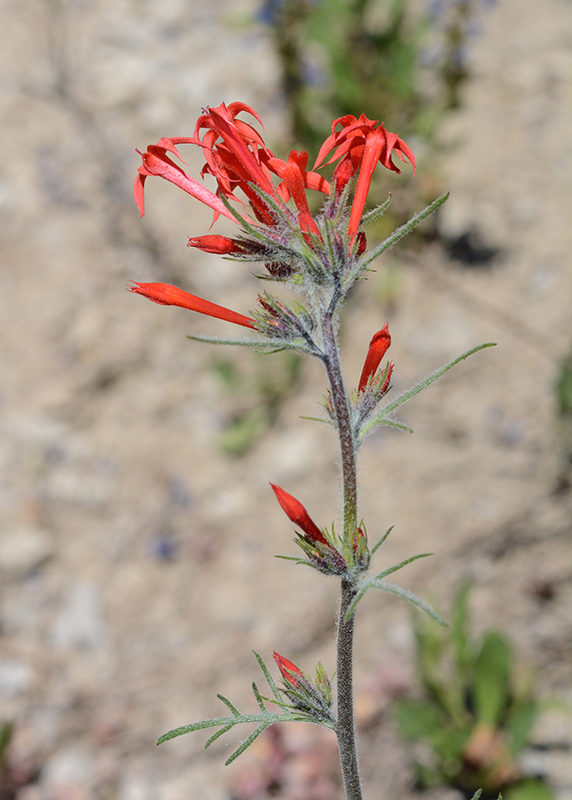 Slightly similar to Scarlet Gilia with tall slender stems and finely divided leaves, the state flower Wyoming Paintbrush – Castilleja liniariifolia – holds out a cluster of red-orange flowers (color ranges widely). Look closely: the flowers of all paintbrushes are oddly structured. Typically, the color comes from leaf-like bracts below each flower. 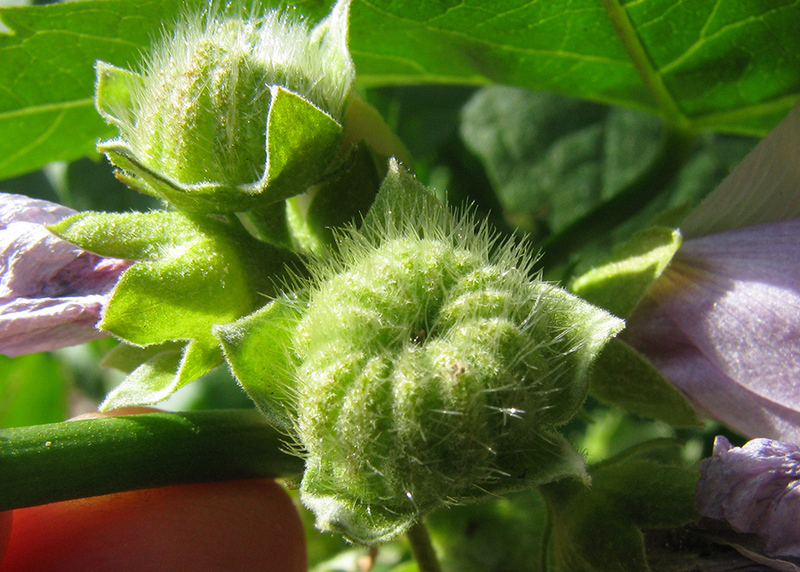 (Here you can see the 3-4 lobed bracts holding the flower above) . The sepals, which are usually green, are also orange-red. They are fused at their base and then split into 4 sharp teeth. In this species, there are 4 pointed teeth and a deep split down the front of the tube. The petals form a yellow-green tube which leans well beyond the rest of the flower parts. The pistil, with its sticky knob at the end, protrudes out the end, ready to receive pollen. 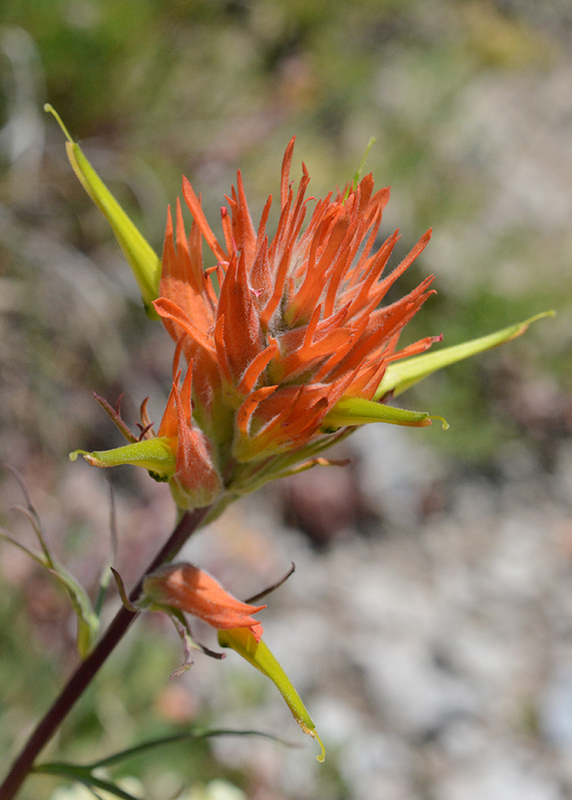 The most red Wyoming Paintbrushes are pollinated by hummingbirds, other shades typically by bees. At the south end of the trail, Wyoming Paintbrush – Castilleja liniariifolia – and companions create a remarkable display reminiscent of an Impressionist painting. 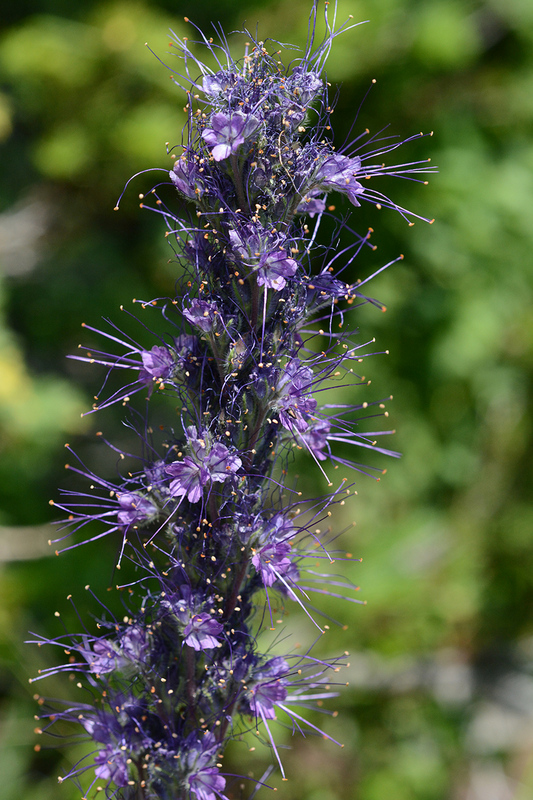 Other flowers include yellow Rocky Mountain Goldenrod, Sulphur Buckwheat; blue Harebells and a small Penstemon; and deep purple Silky Phacelia, to name a few. In locations where snow accumulates to greater depth and melts slowly, a taller more profuse collection of species grow. 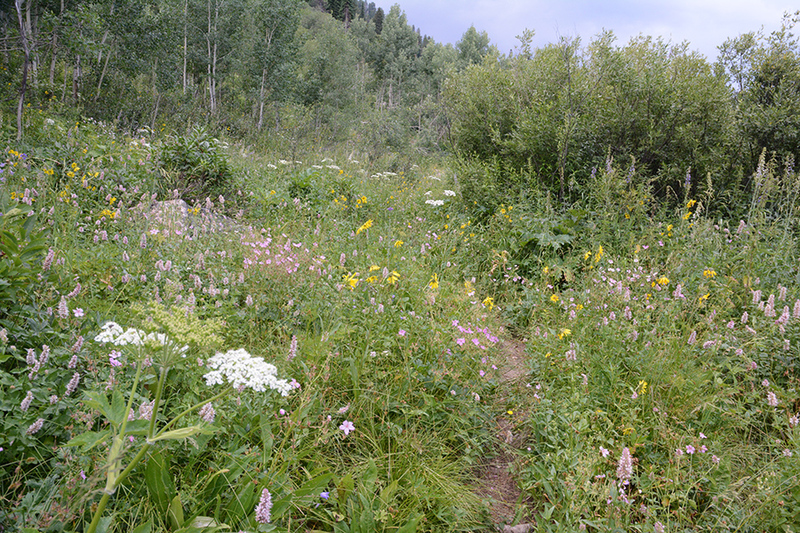 Some parts of the trail collect more snow and consequently have a greater profusion of flowers. 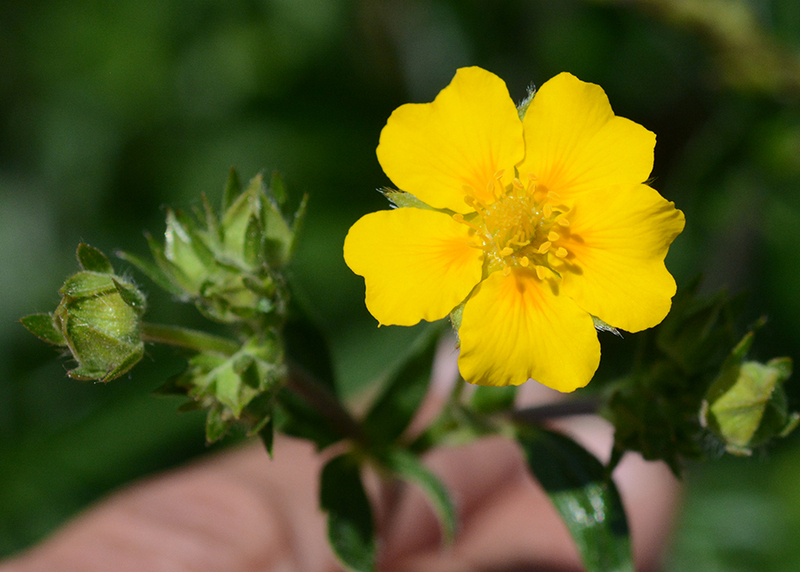 Three cinquefoils – Potentilla arguta, P. glandulosa, P. gracilis – are common on our trails right now. 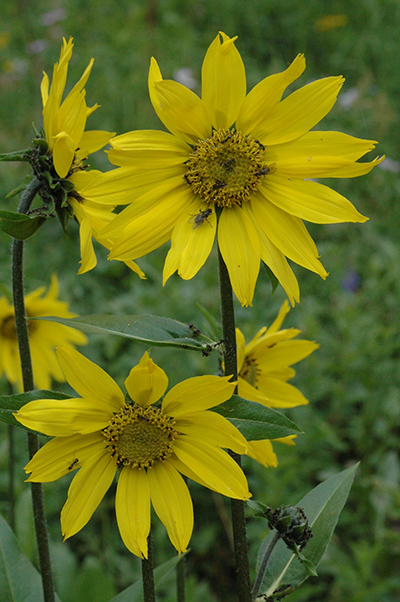 All have five yellow-hued petals that form wide platforms for a variety of pollinators to land upon. Rewards of nectar are hidden in the center. In this species: Showy Cinquefoil – Potentilla gracilis – there is an extra daub of orange at the base of each petal–to help guide pollinators. On the other hand, some flowers have evolved to fit specific pollinators perfectly. In louseworts – Pedicularis spp., bumblebees are key pollinators. They seek both nectar and pollen. When they visit a flower, the bee squeezes in at an angle created by the petals, the bee gets pollen on its hairy back. A pair of its 6 legs has combs to groom off the pollen and stow it into baskets on its hind legs. However, the bee can’t reach the crevice between head and thorax, leaving some pollen behind. The stigma of the lousewort, however, curls perfectly to reach this remaining pollen, and fertilization occurs. Pretty neat! This coiled flower belongs to Parrot’s Beak – Pedicularis racemosa. However, it looks a more like an elephant trunk! 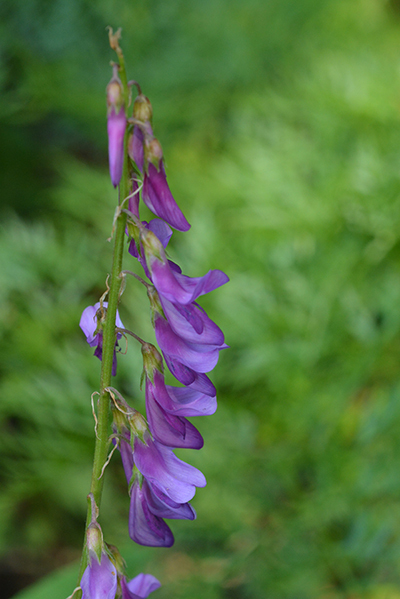 Splashes of lavender purple on meadow hillsides are likely Western Sweetvetch – Hedysarum occidentale. Look for the pea-like flowers and, later, flattened pea pods. 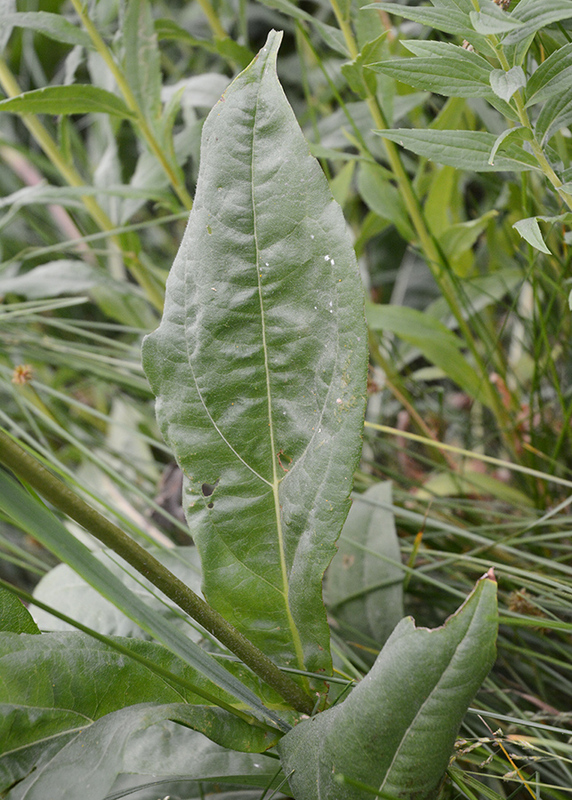 The 12″ leaves are pinnately divided with raised veins. 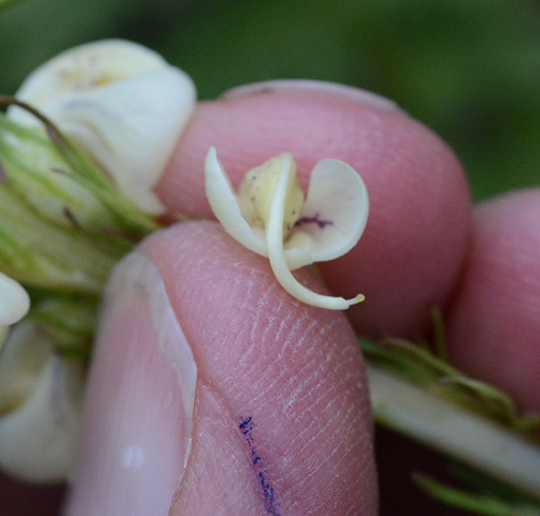 Here are the pea-like flowers of Western Sweetvetch – Hedysarum occidentale. The Pea Family was historically called the Legume Family (Legumosae Family – now Fabaceae). Members of the Pea Family have nodules in their roots that harbor bacteria. These bacteria can absorb nitrogen from the air in the soil and convert it to a form easily used by the plant. Legumes, therefore, can grow in many poor soils, and have for centuries been cultivated to “add fertilizer” to fields. A common plant that looks like For-get-me-not – Myosotis sp. 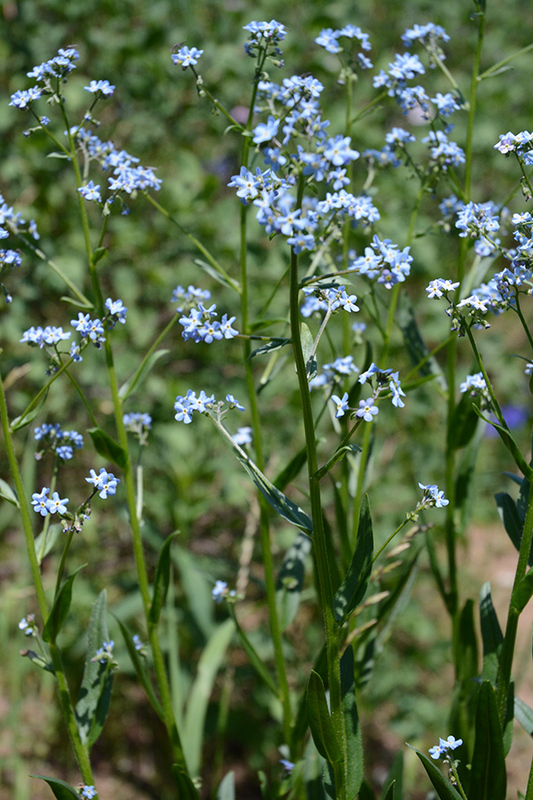 – is Stickseed – There are 2-3 species in Teton County, but Meadow Stickseed – Hackelia micrantha – is a native, blue perennial growing 2-3′ tall. Look closely at the barbs on these fruits. 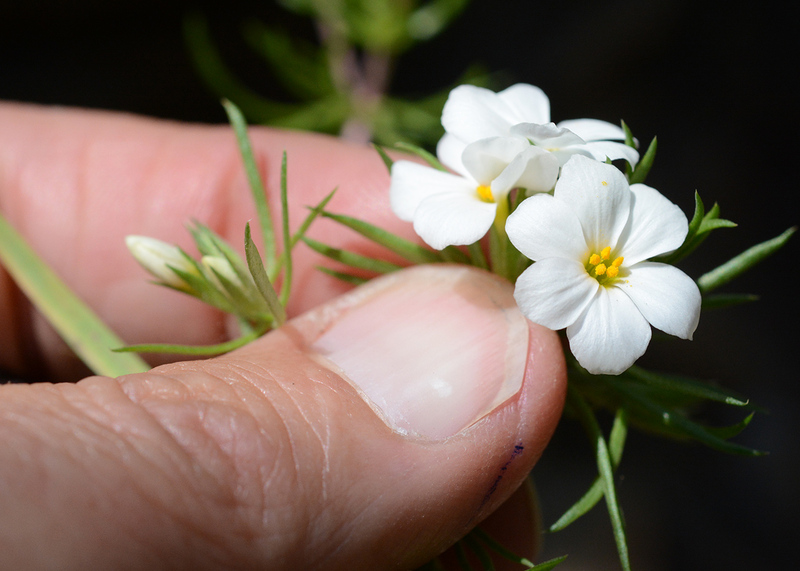 You can see why they are called Stickseed – Hackelia sp. A few more favorites can be seen in mountain meadows right now. 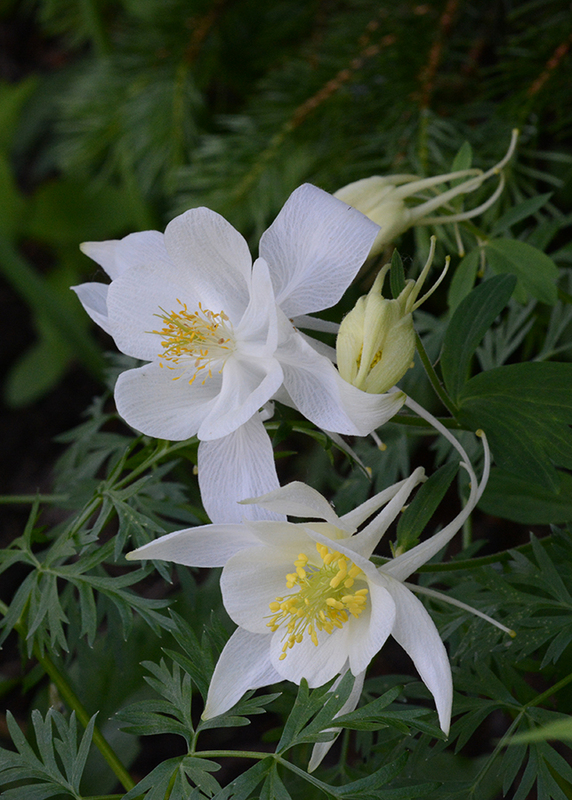 Colorado Columbine – Aquilegia coerulea – is a favorite. Elegant flowers have 5 flaring white petal-like sepals, 5 tubular petals that form 2”-long spurs trailing out the back, and many yellow anthers. Leaves are delicately dissected into 9 parts. These 6-24” plants are pollinated by moths and hummingbirds which have mouth parts that can reach the nectar way back in the flower spurs. 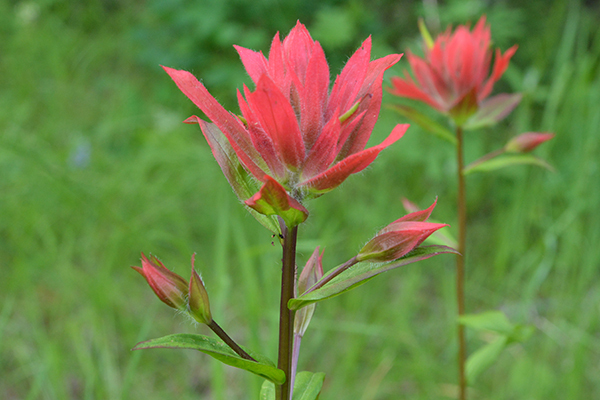 Scarlet Paintbrush – Castilleja miniata – grows in high meadows. The reddish bracts and sepals are highly variable in color. The greenish petals are fused and hidden inside until they finally extend out to a pollinator. Leaves are simple. 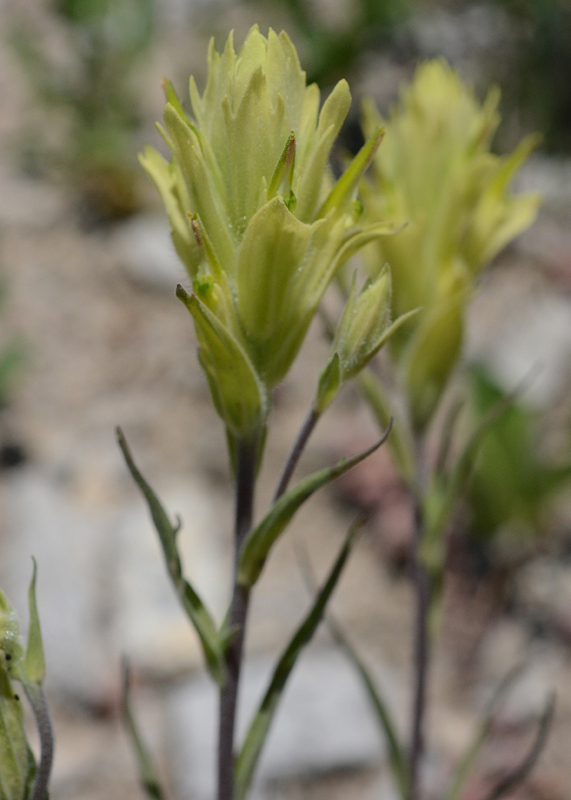 Sulphur Paintbrush – Castilleja sulphurea – is similar in design to Scarlet Paintbrush – C. miniata (see above); however, the bracts and sepals are yellow instead of red. Stems 8-22” often branched. Subalpine to Alpine. 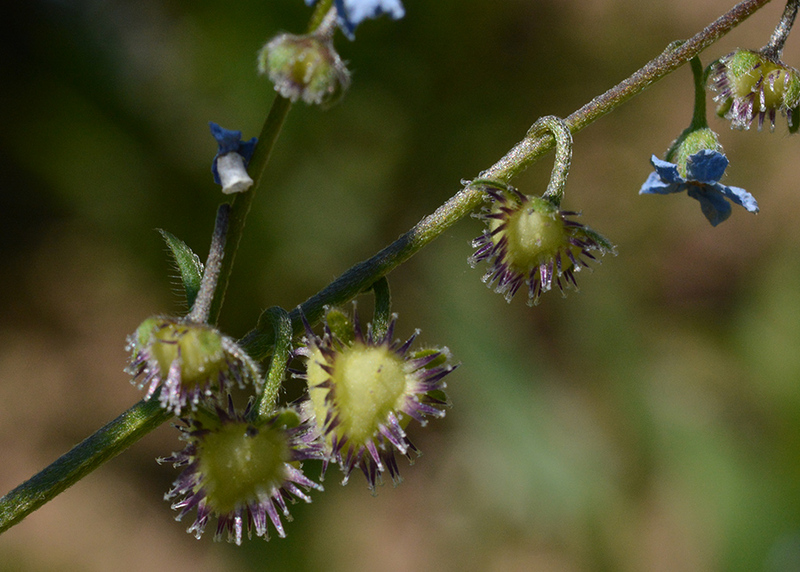 Silky Phacelia – Phacelia sericea – is truly an elegant plant which stands up tall to 2-3 feet in crowds of flowers or alone on trail edges. Stems are trimmed with coils of royal purple flowers, each with elongate, gold tipped anthers. The leaves swirling around the base of the stem are neatly lobed. Continue to hike higher to see the flowers. Your effort will be generously rewarded with bouquets strewn at your feet. Enjoy! Looking north mid-way along the trail south of Teton Pass.